Complete Online Course - covers everything that will be on the CPCU® 500 exam. Designed for faster, easier studying. Completely online and downloadable as a PDF for those that would rather print a physical copy of the course. 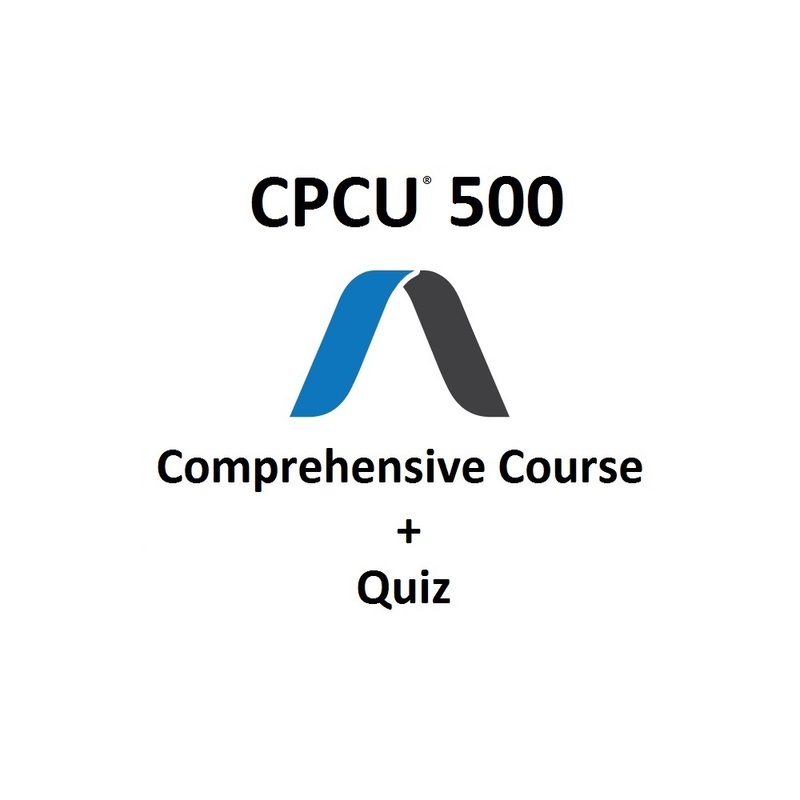 350+ Practice Questions - quiz questions for each topic of the CPCU® 500 exam to ensure you grasp the main concepts. 2 Complete Practice Exams - 60 questions each, formatted exactly like the actual CPCU® 500 exam (with the same number of exam questions) to give you a "real exam" feel. CPCU® Insight - course includes our insight detailing what to expect from each chapter on the CPCU® 500 exam, detailed answer explanation of each quiz question, and our personal email support to provide advice on any question or exam topic. Don't need the full course? Checkout our practice exam course! Includes all of the same practice questions as our full course. Click the button below to get started studying. 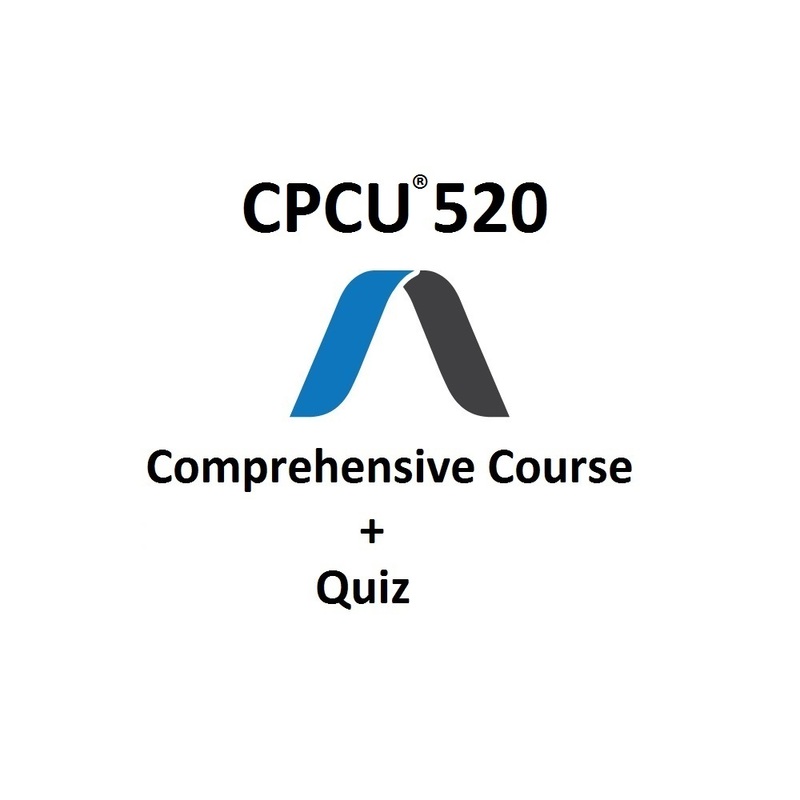 350+ Practice Questions - quiz questions for each topic of the CPCU® 520 exam to ensure you grasp the main concepts. CPCU® Insight - our own personal touch of insight into each exam. This includes our insight detailing what to expect from each chapter on the CPCU® 520 exam, our detailed answer explanation of each quiz questions, and our personal advice on any question or exam topic. Complete Online Course - covers everything that will be on the CPCU® 530 exam. Designed for faster, easier studying. Completely online and downloadable as a PDF for those that would rather print a physical copy of the course. Definitions - a section for each chapter to review definitions, the most important aspect of the CPCU® 530 exam (there are 600+ legal definitions required for this exam). 350+ Practice Questions - quiz questions for each topic of the CPCU® 530 exam to ensure you grasp the main concepts. 2 Complete Practice Exams - 85 questions each, formatted exactly like the actual CPCU® 530 exam (with the same number of exam questions) to give you a "real exam" feel. 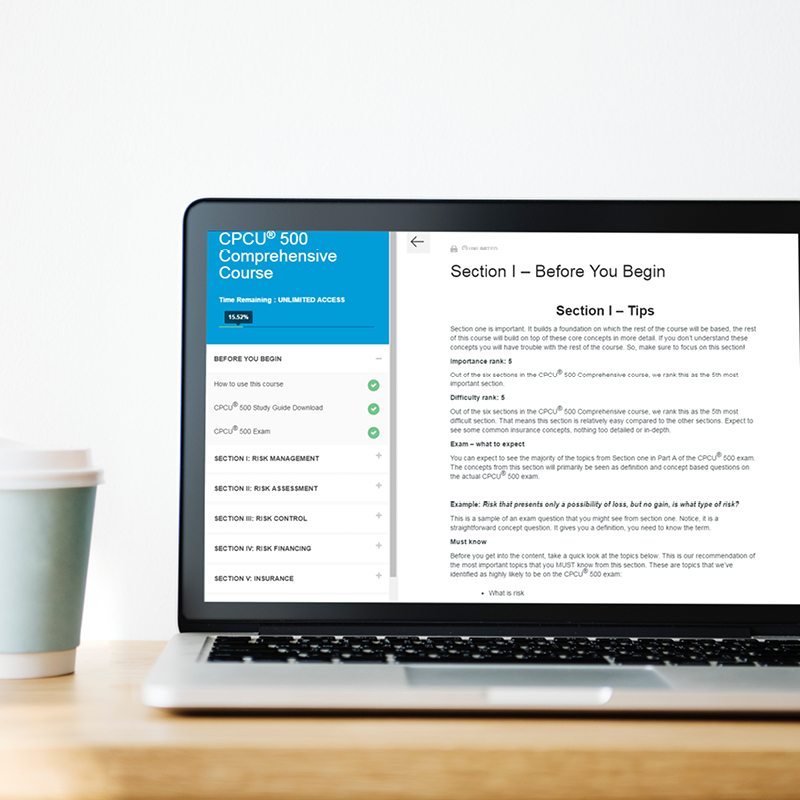 CPCU® Insight - course includes our insight detailing what to expect from each chapter on the CPCU® 530 exam, detailed answer explanation of each quiz question, and our personal email support to provide advice on any question or exam topic. Complete Online Course - covers everything that will be on the CPCU® 540 exam. Designed for faster, easier studying. Completely online and downloadable as a PDF for those that would rather print a physical copy of the course. Formulas - a section for each chapter to review formulas, the most important aspect of the CPCU® 540 exam. 440+ Practice Questions - quiz questions for each topic of the CPCU® 540 exam to ensure you grasp the main concepts. 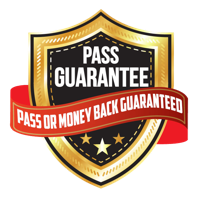 2 Complete Practice Exams - 85 questions each, formatted exactly like the actual CPCU® 540 exam (with the same number of exam questions) to give you a "real exam" feel. CPCU® Insight - course includes our insight detailing what to expect from each chapter on the CPCU® 540 exam, detailed answer explanation of each quiz question, and our personal email support to provide advice on any question or exam topic. Complete Online Course - covers everything that will be on the CPCU® 555 exam. Designed for faster, easier studying. Completely online and downloadable as a PDF for those that would rather print a physical copy of the course. Endorsements - a section for each chapter to review the endorsements and coverages of each personal insurance topic, the most important aspect of the CPCU® 555 exam. 400+ Practice Questions - quiz questions for each topic of the CPCU® 555 exam to ensure you grasp the main concepts. 2 Complete Practice Exams - 85 questions each, formatted exactly like the actual CPCU® 555 exam (with the same number of exam questions) to give you a "real exam" feel. 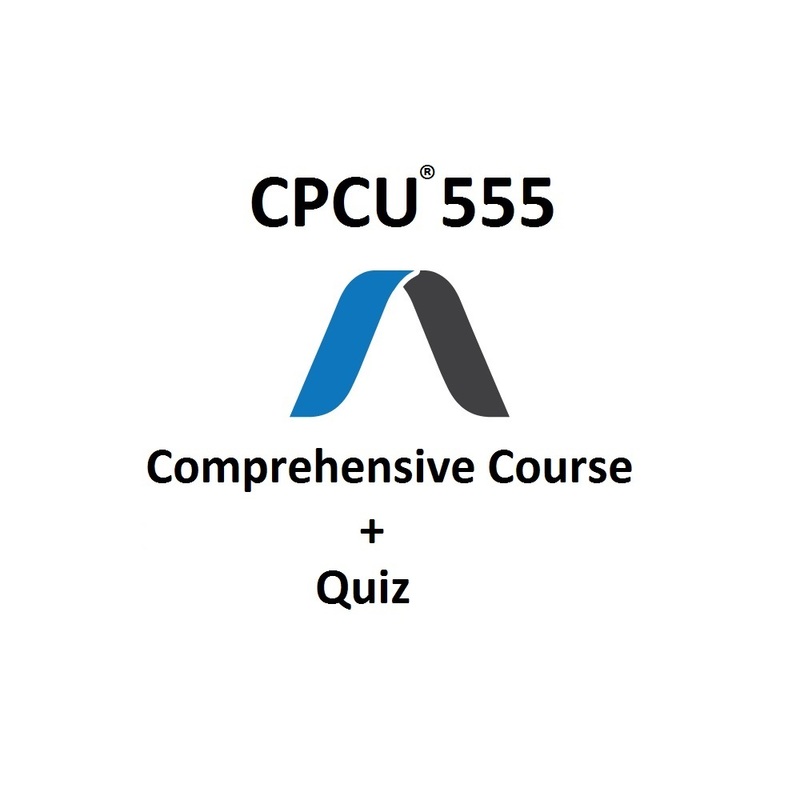 CPCU® Insight - course includes our insight detailing what to expect from each chapter on the CPCU® 555 exam, detailed answer explanation of each quiz question, and our personal email support to provide advice on any question or exam topic. Complete Online Course - covers everything that will be on the CPCU® 556 exam. Designed for faster, easier studying. Completely online and downloadable as a PDF for those that would rather print a physical copy of the course. Important topics - a section for each chapter to review important topics and taxation, the most important aspect of the CPCU® 556 exam. 400+ Practice Questions - quiz questions for each topic of the CPCU® 556 exam to ensure you grasp the main concepts. 2 Complete Practice Exams - 85 questions each, formatted exactly like the actual CPCU® 556 exam (with the same number of exam questions) to give you a "real exam" feel. CPCU® Insight - course includes our insight detailing what to expect from each chapter on the CPCU® 556 exam, detailed answer explanation of each quiz question, and our personal email support to provide advice on any question or exam topic. Complete Online Course - covers everything that will be on the CPCU® 557 exam. Designed for faster, easier studying. Completely online and downloadable as a PDF for those that would rather print a physical copy of the course. Important topics - a section for each chapter to review the most important topics of the CPCU® 557 exam. 400+ Practice Questions - quiz questions for each topic of the CPCU® 557 exam to ensure you grasp the main concepts. 2 Complete Practice Exams - 85 questions each, formatted exactly like the actual CPCU® 557 exam (with the same number of exam questions) to give you a "real exam" feel. CPCU® Insight - course includes our insight detailing what to expect from each chapter on the CPCU® 557 exam, detailed answer explanation of each quiz question, and our personal email support to provide advice on any question or exam topic. 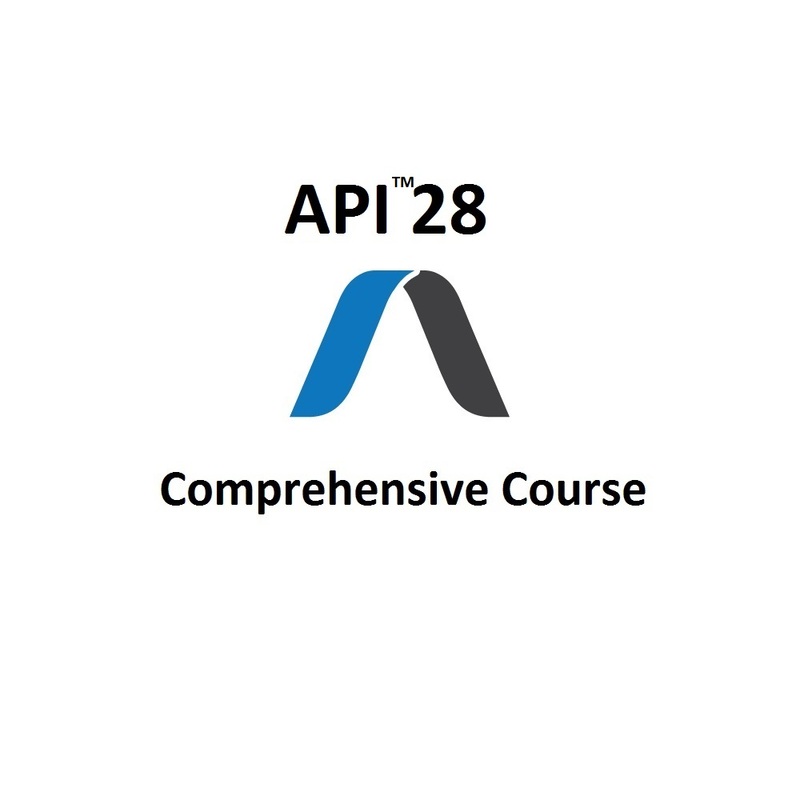 Complete Online Course - covers everything that will be on the API™ 28 exam. Designed for faster, easier studying. Completely online and downloadable as a PDF for those that would rather print a physical copy of the course. Important topics - a section for each chapter to review important topics and underwriting techniques, the most important aspect of the API™ 28 exam. 350+ Practice Questions - quiz questions for each topic of the API™ 28 exam to ensure you grasp the main concepts. 2 Complete Practice Exams - 55 questions each, formatted exactly like the actual API™ 28 exam (with the same number of exam questions) to give you a "real exam" feel. API™ Insight - course includes our insight detailing what to expect from each chapter on the API™ 28 exam, detailed answer explanation of each quiz question, and our personal email support to provide advice on any question or exam topic. 99% Success Rate - we have helped thousands of students pass their API™ and CPCU® exams. In that time, only a few students have failed.